The Cobra 230 uses a fuel efficient and high performing direct drive system to power the impact crusher. This along with the two independent hydraulic controlled aprons allows the operator to optimize the material throughput and reduction while ensuring the best fuel efficiency. The Cobra 230 is the newest addition to EvoQuip's impact crushing range. “The Cobra 230 impact crusher is a machine that provides class leading productivity, unmatched versatility and excellent fuel efficiency. 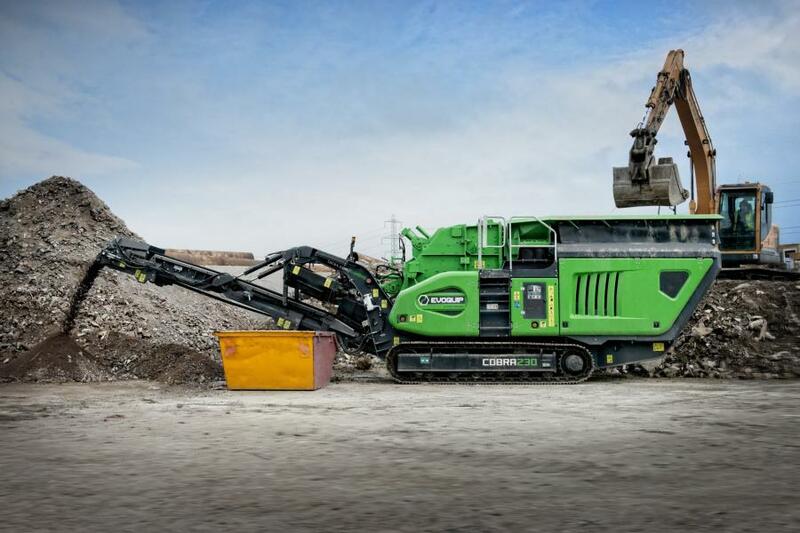 The quick set up times, simple intuitive operation and ease of transport makes this machine an ideal solution for all applications,” said Matt Dickson, EvoQuip, product line director. The rapid set up time and intuitive control system on the Cobra 230 enables the operator to be crushing minutes after unloading the machine from the lorry. The operator also can adjust the crusher setting easily without the need for any tools using the user friendly hydraulic assist that is standard on the machine. There are a number of key design features in the Cobra 230 that ensure an optimal material flow through the crushing process. As material moves from the feeder through the impactor onto the product belt each section becomes wider ensuring an unrestricted flow. The excellent under crusher clearance, the short distance from the crusher discharge to the magnet and the ability to lower the product conveyor while running make the Cobra 230 the ideal machine in all applications, according to the manufacturer. Serviceability has been integral throughout the design and development of the Cobra 230. With ground level access to the engine, hydraulics, service and refueling points, it ensures maintenance is easy for the operator. This is further enhanced with features such as the hinged radiator pack and hinged diesel tank. The compact footprint makes the Cobra 230 easy to transport and also makes it an ideal machine for working in urban areas. EvoQuip machines can come directly to your site to crush and screen the waste from your demolition projects.